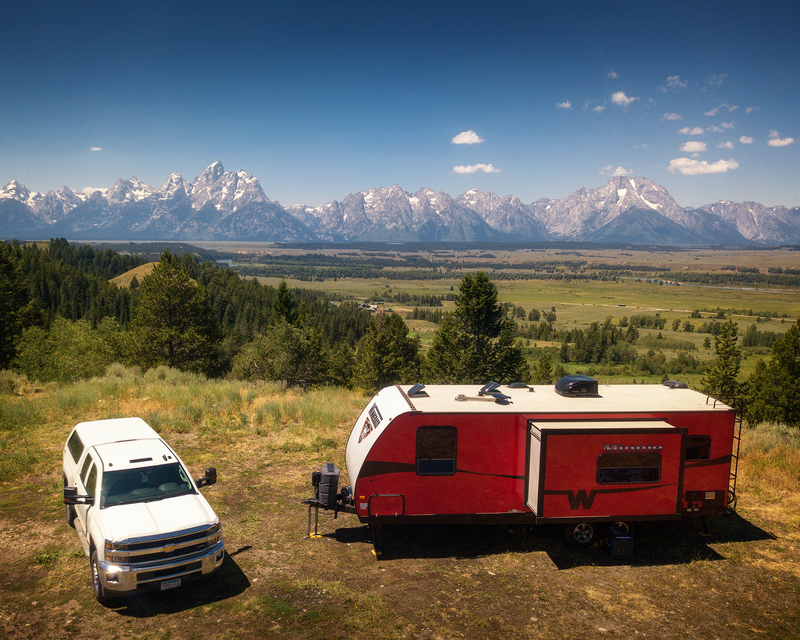 Planning a big road trip with your RV can be a rewarding experience, but it can also be quite daunting. Maybe you have an idea of where you want to go, but what about everything else? To maximize your efficiency, safety and fun it’s important to utilize tools designed to help RVers along the way. “How hard can it be?” you might be thinking. People jump in their cars and hit the road every day. True, but when you have a big rig RV, things get a lot more complicated. There are roads you might not fit on, bridges you may be too tall for and camp sites you can’t squeeze into. Maybe you need to find a last minute place to stay, empty your tanks, find the cheapest gas or simply keep track of all the amazing places you want to visit. 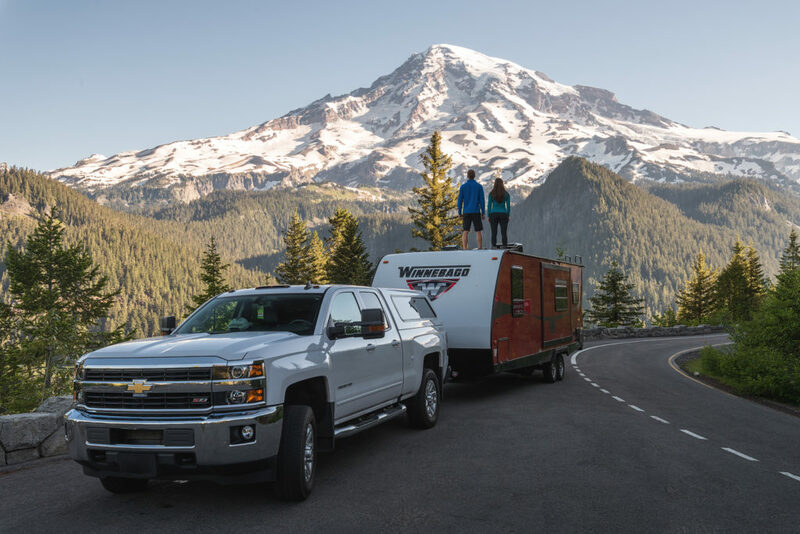 Rather than hopping in your rig and hoping for the best, we’ve selected our Ultimate RV Road Trip Planning Tools below to ensure your next adventure is a success. Over the past 10 months, we’ve had the opportunity to travel 40,000+ miles across the USA in our RV. We have researched countless apps, websites, guides, etc. and can confidently say that the tools below are all you need to hit the road for a week or even a year! While there isn’t one single tool that can do everything (yet), these tools combined should be everything you need to plan your next trip with ease and peace of mind. Once you have a list or map of destinations in mind, the next step is to string them together to create routes. How do you create a good route? It’s all based on personal preference, but you’ll want to be cognizant of driving times between locations and have an idea of how many nights you want to spend in each place. This is where RV Trip Wizard comes in really handy as a planning tool. The first thing RV Trip Wizard will ask for is basic info regarding your RV’s height as well as driving preferences (max distance per day and MPH preference). This info helps establish realistic calculations for distance and time based on how you typically drive your RV and what roads you have the proper height clearance to drive on. This means more realistic driving time expectations for your long driving days! RV Trip Wizard also functions like a calendar, where you assign a date and number of nights to each location. This is especially helpful if you are on the road for long periods of time as you can plan out where you might be a month or two months from now without having to have everything 100% finalized. The interface makes it extremely easy to add and delete locations from a route and rearrange the pins to see how that affects driving time, etc. 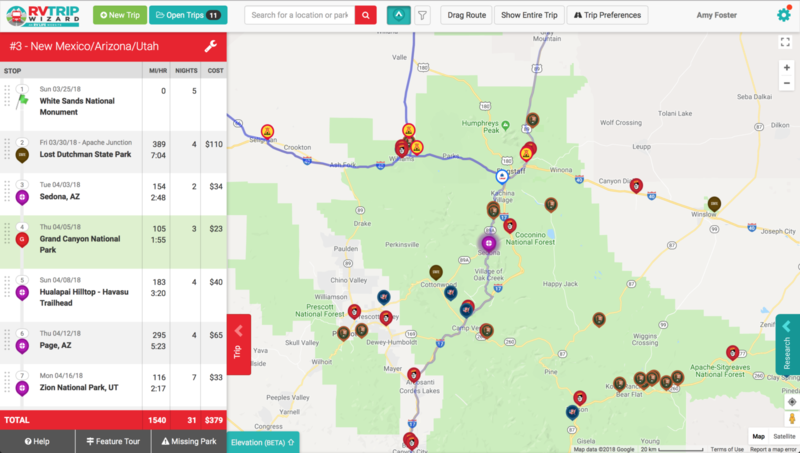 Once your route is closer to being finalized, you can use RV Trip Wizard to show you established camping options near your destinations. It offers you the ability to filter for campsites by type, price, amenities, review rating, discounts clubs and more. Note that it usually shows only established paid campgrounds as opposed to free BLM or dry camping locations. 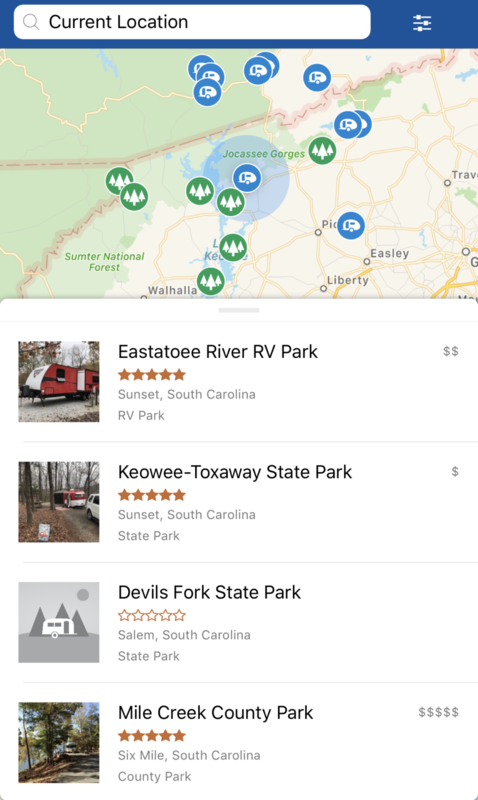 The biggest downside is that RV Trip Wizard does not currently have a mobile app, so it’s difficult to use in the car “on the go.” RV Trip Wizard does allow you to send the routes you create to Google GPS for navigation purposes, but only if done in advance from your computer. 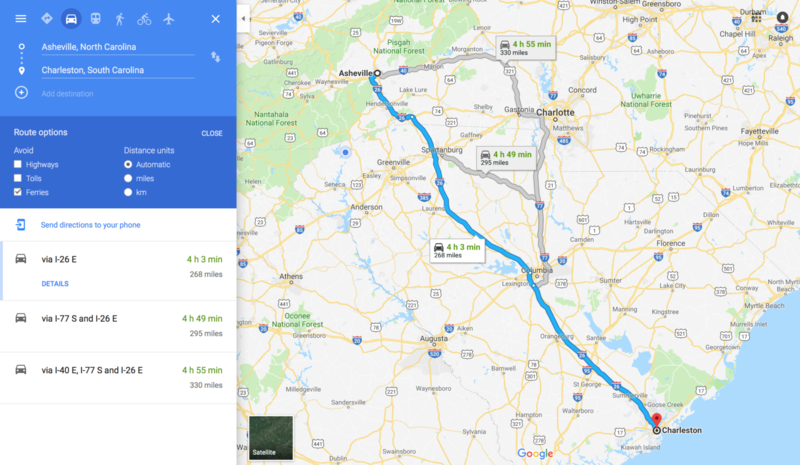 We prefer a little more flexibility in planning, so we typically just input the route locations we created in RV Trip Wizard manually into Google GPS on the day of our journey. 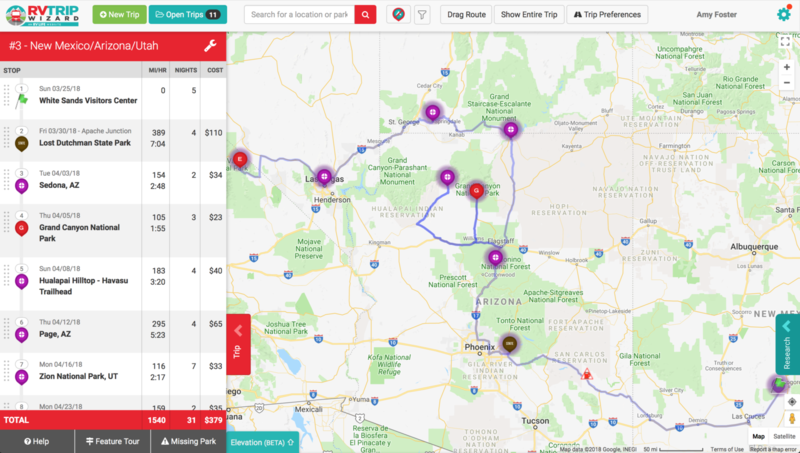 Overall, RV Trip Wizard has been a great tool for planning our 14 month trip and we’ve used it like a calendar for where we will be on a specific day. Additionally, we’ve saved every single route we’ve taken so that we can look back on it and remember where we stopped and camped overnight. We think it is the perfect pre-planning tool for determining routes and keeping track of where and when you’ll be at a specific location. If you are planning an RV road trip to more than 10 locations, it helps to create several route segments as opposed to one giant route. This ensures the map is easy to load every time and you can zoom in to specific regions/states as opposed to the whole US at one time. Campendium is our go-to source for finding campsites and other places to stay overnight. It’s both a web and mobile based app that has an appealing and easy to use interface. Its main focus is showing you places to camp overnight, whether it be established campsites or free off the beaten path BLM land. What we like about it is that it doesn’t overwhelm you at first glance with a bunch of different types of icons on the map. It keeps it nice and simple by showing RV Parks, Campgrounds, Parking Lots or Dump Stations. 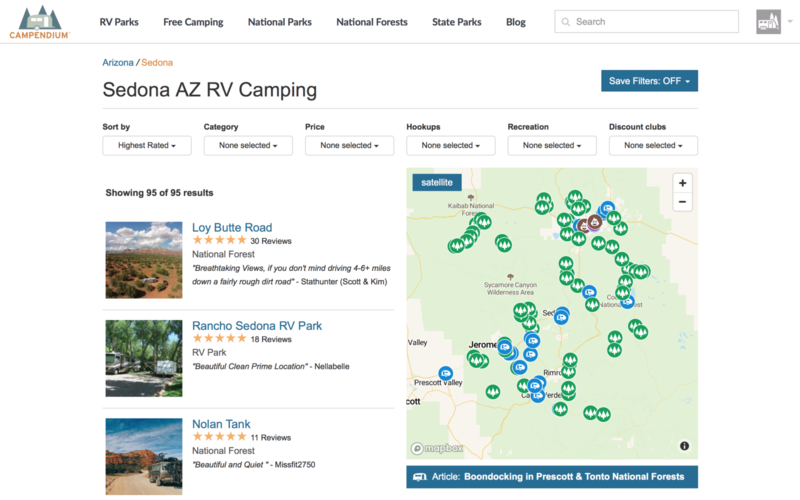 From there you can filter the RV Parks and Campgrounds by price point, review rating, hookup type and a few other options such as discount clubs and amenities. The very first thing I look at when searching for a place to stay is the review rating. Some apps have the reviews visible only after you click on a place and then click on yet another page to actually read the reviews. With Campendium, it shows you a list of all locations with ratings immediately visible on the main page. If you see a place that looks nice with a 5 star rating, just click it and you’ll see the full detail with all the reviews for it listed on the front page. Another thing that makes Campendium different than other platforms is that it also details the cell service for all carriers at each camp site. This is really import for people like us who are working remotely as we need to be connected during the work week. Without these nitty gritty details, it would be really difficult to know if we’ll be able to work at any of these locations. Before choosing a place, always read through the most recent reviews to understand if there have been any major changes recently. Rates, policies and personnel change over time which in turn can affect the overall rating and experience of a place. So make sure you are in the know from those who have visited recently. 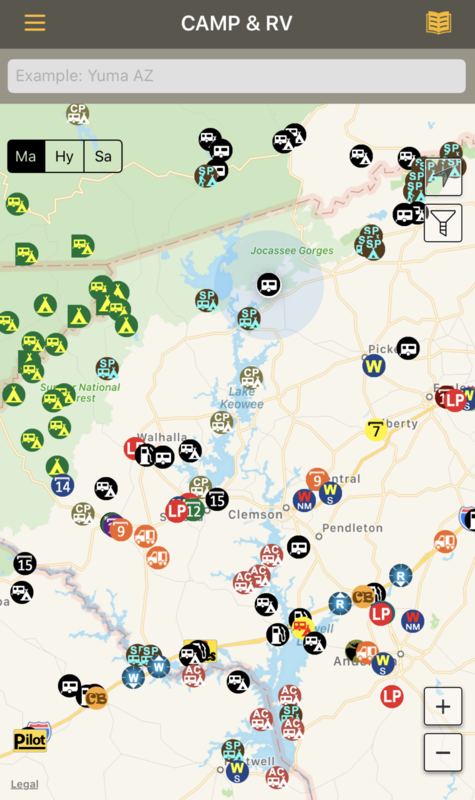 AllStays: Camp & RV is a mobile based app that lets you search for everything from Campsites and RV Repair Shops to Low Clearance Bridges and Dangerous Road Grades. The app has a ton of great info within it, but it can be overwhelming at the same time with so many filters to choose from! We primarily use AllStays as our resource for Low Clearance Bridges. Our process is to filter for any bridges with clearances less than or equal to our RV (anything less than 11ft). Then we double check the route Google Navigation wants to take us on and see if that route is free of any low clearance bridges. Unfortunately, AllStays Low Clearance does not integrate directly with Google Navigation, so you need to do a manual check prior to driving your route. Just make sure you don’t change your route in the middle of your drive without consulting your AllStays Low Clearance indicator! Although AllStays has an abundance of useful information, we don’t use it as our primary resource in searching for campsites or places to stay as the interface is more cumbersome to use. 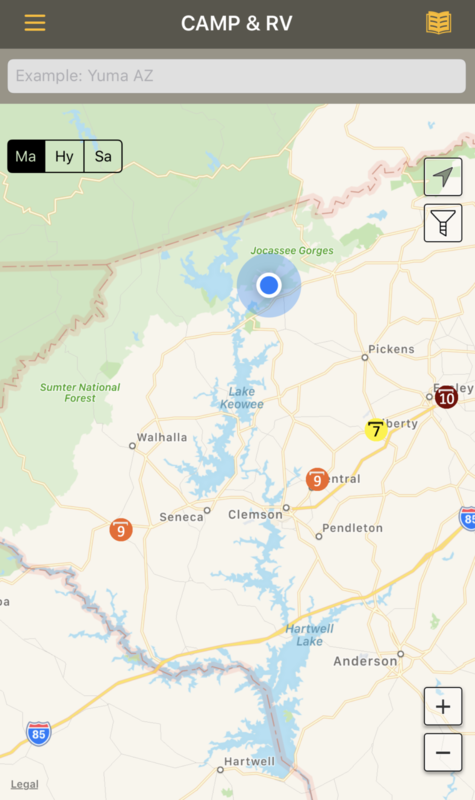 For example, when searching on a map for places to stay, you only see the list of icons, but have no way of telling which ones are rated higher than others. It’s not until you’ve clicked on each icon and opened a new window that you can see the review rating. In order to read the individual reviews you have to click on another link to read them. All in all, not the end of the world, but when we have another resource that makes searching easier I’ll gladly use that one. Want to know which Walmarts allow overnight stays? You can easily find the ones that allow overnights on the AllStays App by filtering by Walmart Ask to Park. As always, make sure to read the most recent reviews to ensure the rules haven’t changed, but this should help cut down on time spent researching. 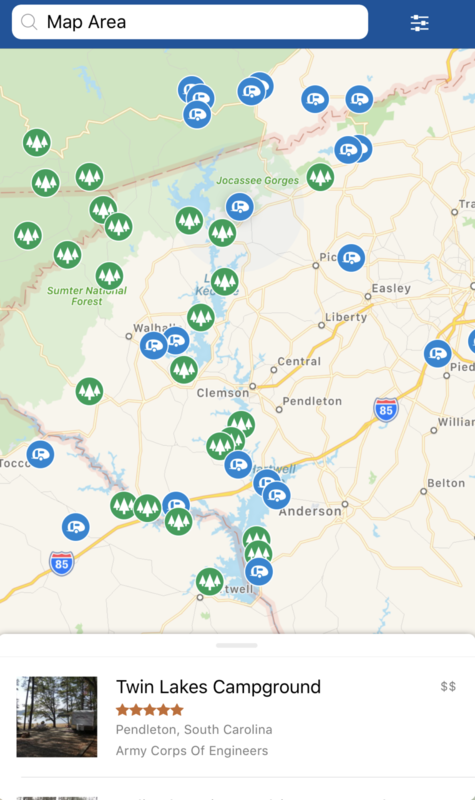 Most people use Google Maps for navigation while on the road (we do too), but have you ever used it to create a map of places you’d like to visit? With Google My Maps, you can create your own customized map by pinning your bucket list of destinations you always wanted to visit along with a link or picture for reference. Google My Maps was the very first tool we used in planning our trip. We started our map 8 months before we left and pinned every place in the USA we’d ever dreamed of going. Granted, we knew we’d never make it to ALL of those places in one road trip, but nonetheless we kept pinning as it helped us create our route later on. One awesome feature Google My Maps has is that it lets you import already created maps into your map, so you don’t need to re-invent the wheel. 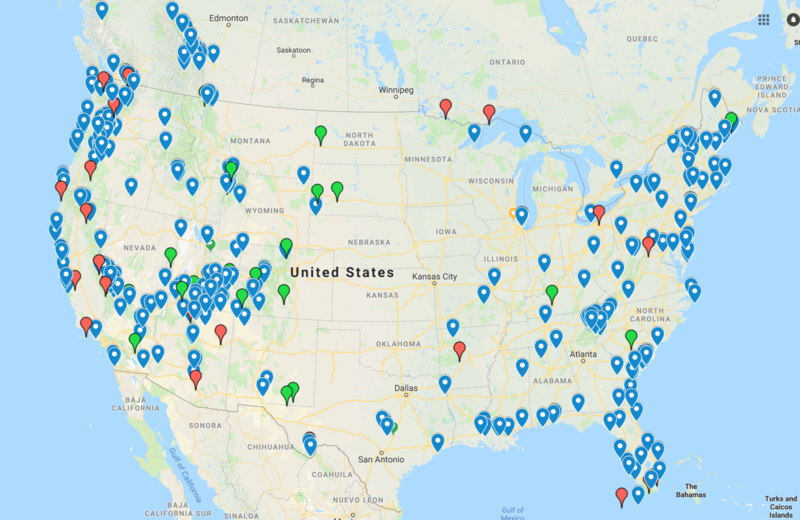 For example, if you want to add all 59 National Parks to your own map, all you need to do is search for a National Parks Google Map, download the KML file and import it into your customized Google map. All 59 National Parks should now appear as a new layer without you having to pin them one by one. Start Now! Even if you aren’t sure when you’ll be able to take your next road trip, start pinning places now. This way you’ll have a map that will not only inspire you to plan for your next trip, but will help you figure out the best route. Get specific and add photos you find on the internet, text that describes the place or links to useful travel guides. We like to separate our pins into category layers, such as: National Parks, Cities, Hikes, Areas of Interest, and more! Google Maps is a great everyday tool for navigating while on the road. Simply enter your destination and it will guide you to it with the option to avoid things such as ferries, toll roads, or motorways. Once loaded on your mobile device, it will navigate you to your next destination even while driving through areas without cell service. Unfortunately, Google Maps isn’t a one stop shop for safely navigating you to your destination. When you are towing an 11ft high, 28ft long travel trailer or driving an RV you can’t assume Google knows the appropriate clearances, road grades and turning radiuses for your vehicle. That’s why its SUPER important to supplement with an app like AllStays that will show you any hazardous roads based on your RV specs. 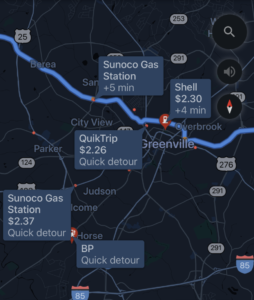 Google Maps can also save you money on gas using the gas station search. Make sure you are actively navigating to your destination, then search for gas stations along your route and you should see a price next to each one. From there, click on the gas station of your choice (preferably the cheapest) and Google will navigate you to it. Simple as that and you’ll save a few extra bucks every time you fill up your tank! These are other helpful tools we’ve used on occasion. Take a look as you never know when they could come in handy! Boondockers Welcome is a another good resource for those wanting to RV on a budget and meet other friendly RV hosts along the way. It’s similar to the idea of Airbnb, but rather allows RVers to stay in hosts driveways or on their land. We utilized Boondockers Welcome in Florida and stayed in the driveway of a lovely couple who took us out on their boat. Keep in mind that since you are staying on someone else’s property, often in close proximity to their house, use of generators is not typically allowed. Each listing is different, so make sure to read the rules and regulations prior to booking. Harvest Hosts is a site that offers RVers a unique place to stay overnight with a bit more character than your local Walmart. The idea is that you can stay FREE of charge for a single night on a local farm, winery, brewery or other unique spot. In return for staying for free, Harvest Hosts asks you to patronize these local business or offer a small donation. We used Harvest Hosts on our initial journey from Minnesota to Florida and stayed at a petting zoo in Georgia! While our experience was certainly unique, we haven’t found the need to use Harvest Hosts more than that one time as its only meant for a one night stay. Typically, we try to stay a minimum of 3 nights any time we stop, with exception of our long driving days. On the days where we are driving for 6+ hours, we end up opting for a Walmart as we have to restock on groceries anyway. Nonetheless, Harvest Hosts can come in very handy if you’re in need of a one night stay and the Walmarts in that area don’t allow overnights.